We nearly missed out on watching the Repertory Philippines staging of Silent Sky because of a last-minute work trip that had come up for me. Thankfully we had season passes so it was possible to just coordinate with the Repertory team to adjust our viewing dates. I cannot recommend the Repertory Philippines season tickets enough, people. Their shows are already some of the most affordable in Metro Manila and the season bundle adds additional discounts. Plus this remains to be some of the best stage entertainment we have in the local theater scene. I wasn't quite sure what to expect from this production, but I naturally had some Constellations vibes as it was yet another show with some ties to astronomy. However it's a completely different experience and one that I found myself enjoying very, very much. Guys, this is now one of my favorite plays of all time. And it's probably because I'm a nerd and a geek. 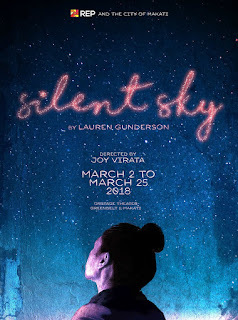 Synopsis: Silent Sky is a stage play written by Lauren Gunderson as based on the life of 20th centruy astronomer Henrietta Swan Leavitt. The Repertory Philippins production was directed by Joy Virata and staged at the Greenbelt OnStage Theater from 2-15 March, 2018. The story begins in Wisconsin where Henrietta Leavitt (Cathy Azanza) tells her sister Margaret (Caisa Borromeo) that she's been invited to work at the Harvard Observatory College. At first Margaret tries to talk her out of it and encourages her to stay at the farm with their father but Henrietta is determined to become an astronmer and even asks for her sister's help in convicing their father to give up her dowry to help her get established in Boston. What I Liked: Yes, the scientific theme to the play was immediately a strong lure to me and made it easier to watch this production. But more striking was the waty the play was written with everyone using physics and astronomy concepts as a poetic language in itself. This reminded me a lot of Einstein's Dreams, a lovely book written by a physicist but with similar prose and metaphors. And that made for some really lovely dialog throughout the play as characters would wax poetic about life using science as their language. Cathy Azanza was amazing in her performance as Henrietta, which is quite the task as she's naturally the focus of the show. She has very little time off-stage and how she survives show after show like that boggles the mind. To be fair, everyone was great in this show and I loved them all, but Cathy totally stood out and commanded this play. And that just made Henrietta's life all the more inspiring and moving. What Could Have Been Better: The play has a lot of tricky moments where multiple characters are speaking withint differnet contexts / locations but their dialog is intentially juxtaposed in order for that layering to add even more meaning. There were many scenes like this and not all of them hit perfectly but on the whole it was still great. And then some of the set decisions struck me as a little odd. I want to nitpick the ocean liner railing designed as a piece that is raised and lowered from the rafters - it might have been more appropriate as something that folds up or slides in from the sides. It just felt oddly distracting every time it would happen, especially since many scenes blend together so just seeing it rise up was the only transition device that draws your eyes away from the characters on stage. TL;DR: This short review cannot capture how much I love this play and how the writing and the acting all came together into a beautiful piece. It's scientific but poetic and at the same time it's dramatic yet light and comedic. It's serious but it's also about love and maybe even a bit of a romcom. I love this play so much and obviously I'm going to give it a full 5 pulsing cepheids out of a possible 5.